On Saturday March 12 Georgia Mountain Falconry was proud to be one of the presenters of Raptor Fest at Elachee Nature Center in Gainesville, GA. 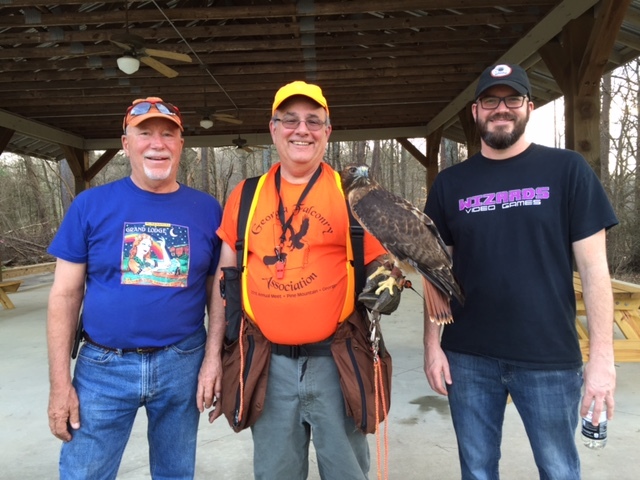 The Elachee event is always fun because they include our friends from Rock City Raptors… John & Dale Stokes, and former DNR Wildlife Biologist Jim Ozier. John & Dale are two of the best raptor program presenters in the country. And Jim is one of those top notch human beings who just happens to be THE expert on the Bald Eagle and Peregrine populations in GA. When you throw in all the good folks at Elachee (Melissa Reid, Peter Gordon and Andrea Timpone), well then, you have a first class event. This year was extra special since Georgia Mountain Falconry was able to host a hawking event on Elachee property for former Lakeview Academy colleague and current Elachee Board Member Jock Horner. Below is GA master falconer Greg Ames with his successful Red-tailed Hawk flanked by Jock and his son Josh. It was indeed a good day!